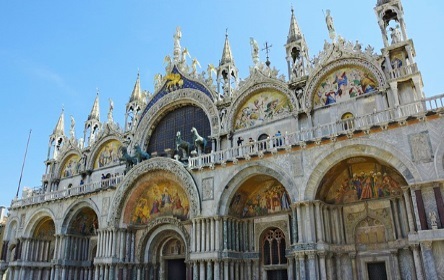 The world-famous Basilica of San Marco is the most important church in the lagoon city of Venice. The present church was built at the end of the 11th century. Previously, another church was at the same place, destroyed by a big fire in 976 AD. During the fire, the Doge's Palace and 200 other buildings in the centre of the city were largely destroyed. San Marco is a church in Byzantine style. In some later extensions there are elements from other architectural styles, especially from the Gothic period. Remarkable are the cross-shaped construction and the five huge portals. You should go to the loggia. You will see the famous 4 horses of San Marco. They are copies, the original bronze horses are in St Mark's Cathedral Museum. The horses were brought from Constantinople (today Istanbul) in 1204. Also impressive are the big amount of gold and the many mosaics in St Mark's Basilica. The mosaics depict the history of Christian salvation. The gigantic size of the church also leaves a long-lasting impression. The highlight for many visitors of St. Mark's Church in Venice is the visit of the Pala d'oro, the gold scholarship above the altar. If you want to see the Pala d'oro, you have to pay 2 Euro entrance fee. The general visit to St. Mark's Cathedral is free of charge, only extras cost a fee. Don't miss the beautiful ceiling of St. Mark's Basilica! The Basilica di San Marco is in the south of the island of Venice at St. Mark's Square. From Santa Lucia railway station or the central bus stop in Venice you can either walk (about 45 minutes) or take a Vaporetto (ferry, also called water bus). Line 1 (about 40 minutes) and line 2 (30 minutes) sail in the Canal Grande. A little faster is the water bus line 51 (about 25 minutes), which runs along the shore of the island. The church is on St Mark's Square, the centre of Venice. The Basilica itself is free of charge. This is great, especially as the visit to other important churches in Venice is not for free. All prices from winter 2018 / 2019. There are some reduced entrance fee, for example for students (about 50%). In our opinion, a visit to the Pala d'oro for 2 euros is definitely worth it. The treasury didn't impress us as much. It consists of two smaller rooms. Since St Mark's Basilica is free of charge, the amount of people are even bigger than at the neighbouring Doge's Palace. You can only walk through the church on a certain path, the entire visit to the interior of the church takes about 15 minutes (without climbing the tower, etc.). For security reasons it is not possible to take bags and backpacks into the church. You can hand them in for free at a cloakroom in a house nearby. Venice attracts more and more tourists. The majority of the millions of guests of Venice wants to see the great sights, including the Doge's Palace and the St. Mark's Church opposite. Often there are very long queues and extremely long waiting times. As far as we know, there is only one way for tourists not to queue up. You buy a ticket in advance online. Guided tours, tickets and further information are available at Getyourguide.com. St Mark's Cathedral has long opening hours during the week, only on Sundays the opening hours are short. St. Mark's Church can also be closed during opening hours. This is especially the case when a mass or another event takes place in St. Mark's Basilica. Typical opening hours of the Markus Basilica are: Monday to Saturday 9:45 to 17 o'clock. On Sunday you can visit the most famous church of Venice only in the afternoon from 2 pm to 4:30 pm. The exhibitions (Treasury of St Mark, Pala d'oro and St Mark's Cathedral Museum) have similar opening hours. The opening time of the bell tower of St. Mark's Cathedral are considerably longer. In summer the church tower can be climbed from 8:30 to 21:30. In winter, the opening hours are much shorter from November to Easter from 9:30 a.m. to 5 p.m., partly due to early darkness. There is no difference in the opening hours of St Mark's Basilica on weekends and workdays. The tower is not directly at St. Mark's Cathedral, but opposite on St. Mark's Square a few meters away. Free-standing bell towers are typical for Venetian churches. In churches in Italy you should not wear shorts and cover your shoulders. Unfortunately, photography and filming is prohibited in the basilica, even without flash. St Mark's Basilica in English, Basilica di San Marco in Italian and Basilique Saint-Marc in French. The bell tower of the Basilica of St Mark is called "bell tower" in English and "torre", more precisely "Campanile di San Marco", in Italian. The Treasury is called "Tesora" in Italian. Early history of St Mark's Basilica Venice: Around 830 (the exact year is unknown) a church was built on this site for the first time. It was destroyed in 976 by a very large fire in Venice together with many other buildings. Afterwards a new church was built, which was soon demolished again. 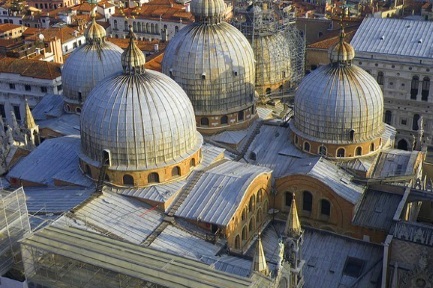 The third church is today's St. Mark's Basilica in the cross shape. Later the basilica was renovated and extended several times. In the 13th century St Mark's Cathedral was enlarged. The well-known domes also date from this period. Much of it was also built later, for example the beautiful Gothic-style windows date from the 14th and 15th centuries. Facade of St. Mark's Church: 5 large arches dominate in the lower area, above are 4 more arches. Interesting are the mosaics made of polychrome (multi-coloured) marble. 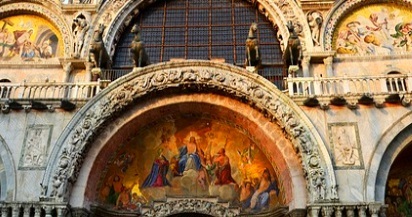 Among other things, the pictures tell of the arrival of the mortal remains of Saint Mark to Venice. The painting depicting the Last Judgement in the middle of the cathedral above the entrance is also famous. Another highlight on the facade of St. Mark's Cathedral is without doubt the statue of St. Mark. Even more famous are the 4 large bronze horses that were taken on a crusade in Constantinople in 1204. You can see them above the picture with the Last Judgement over the middle arch of the fa�ade. The 4 bronze horses at St. Mark's Cathedral (Quadriga marciana) are copies, the original quadriga can be admired in the Museum of St. Mark's Church. Almost every visitor is deeply impressed by the enormous size of the building and the many pictures and decorations made of coloured marble and gold after entering St. Mark's Church. The mosaics are among the most famous in the world. They tell stories from the Bible. In the anteroom you can see scenes from the Old Testament. The highlight are the mosaic pictures in the main room, which tell the story of Jesus (New Testament). The scenes from the Bible on the walls and ceiling of St Mark's Cathedral were created over many centuries, and well-known artists such as Titian and Tintoretto have also contributed. The mosaic patterns on the floor inside the Basilica di San Marco also fascinate many churchgoers. Just as overwhelming is all the gold on the ceiling. Pala d'oro: Another highlight of the many world-famous works of art in St Mark's is the Pala d'oro. It is an approximately 5 square meter large attachment on the altar consisting of gold, silver. Pearls and gems (sapphires, emeralds and garnets among others). The magnificent iconastasis in the choir of the church in figures depicts Mark, Mary and the 12 apostles. In art, an iconastasis is a wall with three doors with icons. The tomb of St. Mark in St. Mark's Basilica is also worth a visit. In the baptistery in the anteroom you can see some great works of art. The portrait "Dance of Salome" is particularly famous. Worth seeing is also the Tesoro, a treasure chamber with many valuable objects. Most are, similar to the famous bronze horses, from the raids in the East. The Museo di San Marco (St Mark's Cathedral Museum) contains some important objects. Above all, these are the original 4 bronze horses already mentioned above (copies are on the facade of St. Mark's Church). The life-size, gold-plated horse quadriga is the only antique horse sculpture of its kind in the world. Italian name: Cavalli di San Marco or Quadriga marciana.